This bypass capacitor calculator calculates the value of the capacitor based on the frequency of the input AC signal and the resistor in parallel to the capacitor. 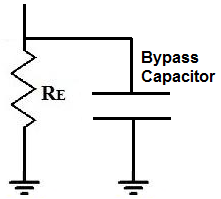 A bypass capacitor is a capacitor that bypasses, or shunts, unwanted AC signals on a DC line. This allows the DC signal to be more purely DC and less noisy. How we're able to determine the value of the bypass capacitor that we need is based on the principle that the resistance that the capacitor offers to the AC signal should be 1/10th or less of the resistance in parallel with the capacitor. Remember that current always takes the path of least resistance. Therefore, if we want the AC signal to get shunted to ground through the capacitor, the capacitor must offer substantially lower resistance than the resistor it is in parallel to. The way professional engineers typically choose the value of the capacitor is that they make sure that the capacitor's reactance is one-tenth or less of the resistance of the resistor in parallel based on the lowest frequency desired to be bypassed. This ensures that effectively the AC component to shorted to ground, since it offers such substantially lower resistance. We always based this on the lowest frequency desired to be filtered out, because high-frequency are easier to filter out because the higher frequency a signal is, the less reactance a capacitor offers it. So we always decide what's the lowest frequency we want filtered out, and then compute the value of the capacitor based on that value. The most common frequencies desired to be shunted to ground are 50Hz and 60Hz. This is because these are the frequencies used worldwide for AC voltage from a wall outlet. Since many circuits are connected to wall outlets and operate from them, they are exposed to the 50Hz and 60Hz frequencies. From the wall outlet can be noise and other inference that introduces noise to our circuit. Therefore, we typically just want to shunt whatever is on these frequencies to ground. And, normally, we only worry about low frequencies with bypass capacitors. This is why the capacitor also recognizes hertz. High-frequency signals get filtered basically with any capacitor because capacitors don't offer much reactance at all to high-frequency signals. So normally, when we reference frequency, we are talking about the tens of hertz, not kilohertz or megahertz. So we choose the value of the lowest frequency we want filtered out and then all frequencies above that also will be filtered because the capacitor offers them even lower reactance. And the other component of the circuit that affects the capacitor value is the resistor in parallel to the capacitor. A higher resistance makes for a lower-valued capacitor to be used. A lower resistance makes for a higher-valued capacitor. The resistor and capacitor are in parallel, so they form a current divider. Current takes the path of least resistance, so the value of the capacitor is chosen so that it is 1/10 or less of the resistance of the resistor for the particular frequency we want filtered out. So the formula to calculate the reactance of the capacitor is, XC= 1/2Ï€fc. Rearranging this formula, we get, C= 1/2Ï€fcXC. XC is the reactance that we want the capacitor to offer. Since we want the reactance to be 1/10th of the resistance of the resistor, XC= RE/10. So this is why XC equals in the formula shown above. So if our resistor is 470Î©, then XC= 47Î©. Let's do an actual example now so that you can follow it value by value. Let's say we want to find out what value of a bypass capacitor that we need if we want to filter out an AC signal of 60Hz with a 500Î© resistor in parallel to the capacitor. Plugging into the formula, C= 1/2Ï€fcXC= 1/2(3.14)(60Hz)(500Î©)= 54Î¼F, rounded up. You always want to round up to give a little space for error. So that's how this calculator computes the minimum capacitor value needed. Usually, if you are dealing with the tens of hertz and 400-500Î© for the resistor, a 100Î¼F will always suffice very well. However, if you are using lower frequency values or lower resistance values for the resistor, you may need a bigger capacitor. If you are using a much greater frequency or larger resistor value, you can use even a small capacitor than 100Î¼F. So this calculator forms a tool to compute the bypass capacitor that is needed to shunt a certain AC frequency down to ground.